The Chobe region is home to the largest population of wild elephant in the world. Their sometimes daily passage takes them from Zimbabwe through the Chobe and on into Namibia before returning. Elephant Valley Lodge lies along one of these routes and is situated in the Kasane Forest, which is adjacent to the Chobe National Park. Open guest areas, a secluded hide, refreshing swimming pool and 20 ‘meru styled’ tents complete the lodge which lies beneath a forest of sturdy knob thorns. It is within these tree tops that the largest colony of white back vultures occurs. 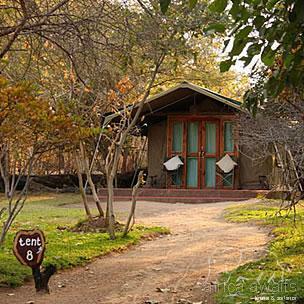 The lodge is unique for several reasons and amongst these is the fact that it is situated within a game rich reserve affording the guests wonderful sightings between the open landrover safaris into the Chobe and boat cruises along the Chobe River. The camp perimeter is fenced to keep the elephant from moving through the camp, instead now they move around the camp boundary, along their well worn paths to and from the Chobe River. Your tent also ensures that you are able to hear the multitude of night sounds as you drift away with vivid thoughts of the experiences of your day on safari. 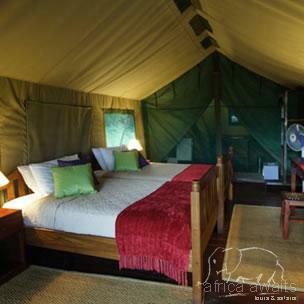 Each of the tents features twin beds, ensuite shower and toilet, mini safe and fan. 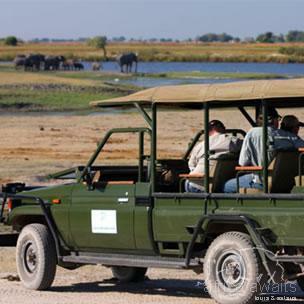 At Elephant Valley they have found that a morning cruise along the Chobe River provides a couple of distinct advantages that include the following; During the morning the river is distinctly less busy with fewer boats. This also permits a longer experience, assuming that sightings keep on busy. It does also permit a greater length of the river to be explored. In the afternoons they have found that the Chobe National Park is conversely less busy and one is able to enjoy a sundowner along the river to capture the sunset on camera. It is also during the late afternoon that game becomes most active. With your holiday, safari or business trip from in to Elephant Valley Lodge in Botswana.